Trekking poles makes hiking a full body workout! Learn the best pole hiking benefits as I review using hiking poles for balance, tent poles & more! Hiking’s an incredibly versatile sport that can be done in a variety of different terrain, weather situations, or seasons. You can go hiking in a flat glade at the height of summer, or you can take your trekking poles with you as you climb as the mountainside in the dead of winter. With the great variety in hiking, there’s also great variety of tools you can use to aid your exploration of mountainsides, valleys, glades and more! Ever since I bought my hiking poles a few years ago, I’ve never looked back. My endurance has improved dramatically, crossing snowfields is simple, and my balance is fantastic on rocky terrain. 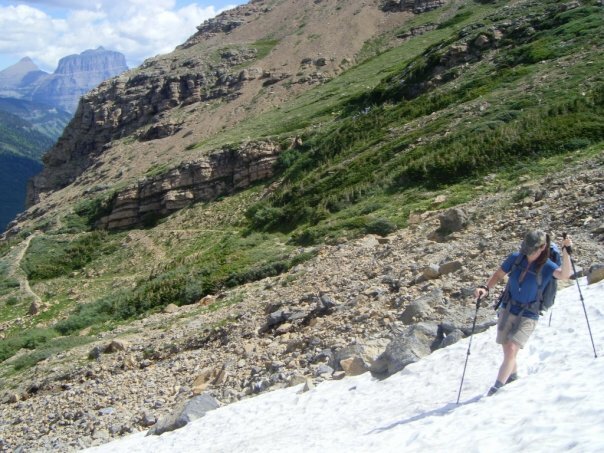 Keep reading to learn more on why I think everyone should be hiking with trekking poles! Of course, one of the absolute best pole hiking benefits is how it helps to improve the health of your entire body. By getting your arms involved in the action of hiking, you are creating a full-body workout. Don’t worry, that doesn’t mean you’ll be sweating in seconds, cramping in minutes, and trying to recuperate for hours. It isn’t a strenuous activity–unless you want it to be–but rather one that sneaks up on you. Let me explain: trekking poles actually make hiking easier, dispersing your weight, and allowing your arms and shoulders to take some of the burden off your legs and feet. This means you get more endurance for your hikes by using trekking poles (also, if you use antishock trekking poles, your knees are relieved of the shock from every step). And by forcing your arms and shoulders to participate in the hike, you’ve then made it possible for them to get on the receiving end of some good workout time. Your body is everything you have. If you treat it right, it will help you enjoy your life for as long as humanly possible. If you ignore its needs, then you’ll have a much harder time staying healthy later in life. Hiking with poles is one way to ensure that you’re as healthy as can be. It’s definitely not the only way to stay healthy–I hope that’s obvious–but it’s certainly a great help. Aside from your health, what’s another great entry in the long list of pole hiking benefits? How about the way that it allows people who aren’t able to do regular hiking to get up on the trails and into Mother Nature’s beautiful garden? For some folks, hiking the woods or the mountain just isn’t possible. Their ankles or knees are too weak, their legs are too stiff, their breath is too short, or their balance is too off-kilter. Well, by adding trekking poles into the equation, many of these ailments can be cancelled out. In some cases, the use of trekking poles may actually reverse some of these ailments. When it comes to weak knees or trembling legs, using trekking poles removes the shock and burden from your lower body, allowing you to hike further into your hold age. All of this is especially true of senior citizens, or those who think themselves too old to be walking in the woods or on the mountainside. Don’t fall into that trap! My grandfather was outpacing me on the trails of every National Park we visited until he was well into his seventies. He was a healthy guy, mostly because of his love for the outdoors. If he made excuses and stayed inside all the time, he probably wouldn’t have been able to hike as much as he did. But he had the desire and perseverance to get out there, improve his health, and enjoy the absolute splendor of Mother Nature’s beauty. Other groups of people who might feel the benefits of using trekking poles while hiking are younger kids and those who live with physical challenges. Don’t let your age or body keep you from a healthy lifestyle. Take up a pair of trekking poles and you can start along the path toward a new and better life. Have you ever lost or broken a tent pole and just had to make do with either a nearby branch or a tent without proper structural support? Yeah, I think we all have. Well, if you’re hiking with trekking poles, you don’t have to worry about that ever again. Your hiking poles can easily be used as replacement tent poles. And if they work really well, you may not even have to worry about lugging tent poles up the mountain at all–just use yours and maybe your hiking partner’s poles to form your tent. Some of the best backpacking tents don’t even have tent poles. They are super lightweight because they sacrifice the weight of tent poles and require you to use hiking poles instead. Aside from your health, your age, and your tent, there are a number of other pole hiking benefits. Here’s a look at a few more. 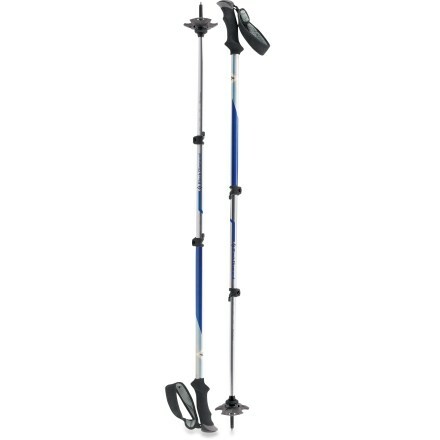 Balance — Trekking poles are great at improving your balance. If you’re hiking on some uneven terrain, it can be pretty easy to pitch over and fall on your tush. But with trekking poles, you can keep your balance and stay on your feet no matter what condition the trail is in. Critter Control— Have you ever run into a snake on the trail? I have. How about spider webs, lizards, or other small critters? I’ve met those, too. The best thing to do when that happens is to walk the other way, but if you need to pass, you can always use your trekking pole as a prop. Just be safe and think about what you’re doing. Going Where You’ve Never Gone Before — Trekking poles increase your endurance, making it possible for you to go hiking into areas that you may never have been before. As a hiking enthusiast, I can tell you that there’s nothing better than rounding a strange bend and getting a glimpse of some brand new massive natural vista. See the sights–not just the ones you can easily get to, but all of them! Are there any more pole hiking benefits? You bet there are! Hiking with poles is exciting, healthy, and helpful. Learn more about hiking poles with my overview on everything related to them! 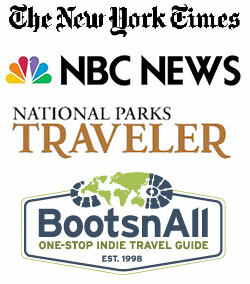 Or head back from pole hiking benefits to Glacier National Park Travel Guide’s homepage.